Full democracy countries are the ones in which to live. This week's story could start and end with the above graph with almost no further explanation. But that wouldn't do it justice. So, like so many of the past articles on "Graph of the Week", a bit of analysis will be provided based on collected data and research. 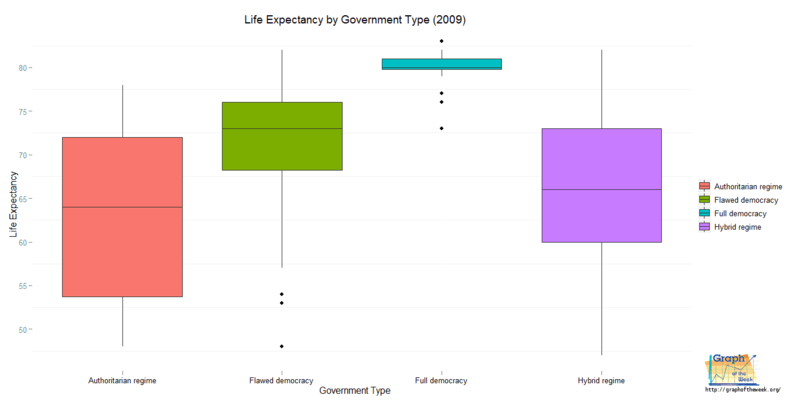 Starting with what is shown above, it is clear that people tend to live longer under full democracies. The range of life spans under this type of government nearly always are above 80. Compare that with other forms of government where only a select few nations have longevity near that age. And as might be expected, authoritarian regimes have the most countries with comparatively short life expectancies. The Nordic countries lead the way again. In many of these countries, there is some form of universal healthcare which accounts for much of the spending. Regarding the U.S., a significant amount is spent on Medicare and Medicaid, but there is no universal health care. There certainly seems to be a relationship between freedom, compassion and longevity in countries embracing full democracies (see previous chart showing democracy index and internet penetration). In other words, those countries that look after their own tend to live longer lives. Since humans are a social species, this isn't a surprise. There is usually some form of universal health care in authoritarian regimes as well. On the surface, it would appear that all things are equal until the amount of spending on health care is examined. 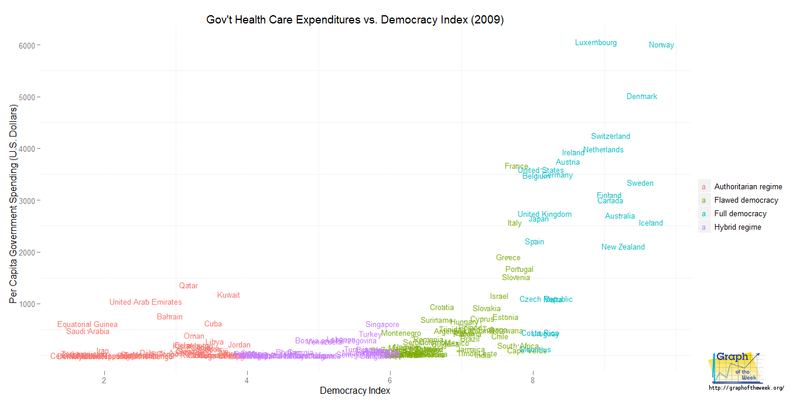 Clearly, full democracies spend much more on their systems than the others. That, combined with the longevity factor paints a picture which suggests more spending is needed to increase life spans. It is not enough to simply have a universal health care system; rather, the quality of that system is what drives longevity. That being said, the quality of a health care system isn't reflected by the amount spent. 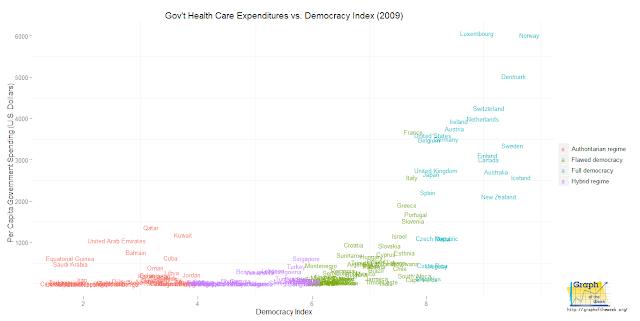 It is useful to see expenditure as an indicator, but not as a cause of a quality system. To more accurately evaluate this aspect, further research would be needed and is out of the scope of this article. Countries in which their citizens have little voice in their own destinies would do well to make changes to reverse this situation. Unfortunately, most leaders in power are loathe to give up said power due to its many perks - at the cost, health, happiness and freedom of its citizens. This is a tragedy on a global scale. This has been the 2nd article to identify a relationship between democracy and other factors. The first showed that internet availability is much higher in countries with a high democracy index. Stay tuned for more articles in this series. 1) When might we see the highest average life span creep into the 90 year range? 2) The Arab Spring has started - will something similar happen in other authoritarian countries? 3) Has quality of life (not the same as standard of living) also been improved along with longevity? Patrick, your graph is very thought provoking. Please when and if you return to the subject, or engage it in a different way, I'd be curious to see your graphed response to your question: 3) Has quality of life (not the same as standard of living) also been improved along with longevity? It would be most interesting to see the "quality of life explained" definitely--and how that in and of itself relates to a "democracy." Thanks again for your amazing work ethic. Well, I'll have to rely on collected data. And, since 'quality of life' is a subjective measure, it'll have to be taken with a grain of salt, so to speak. If I can find good data, then I'll work something up. I often follow your graphs with interest. This time I can't seem to find where does India stand in the graph. India is possibly the largest democratic country yet the life expectancy is quite low there (64.9 in 2009). India is in the 'flawed democracy' category with a democracy index of 7.3 (as of 2011) - that puts them in the green-colored section in the above charts. In response to your statement about the size of the country - population was not considered as a factor for this article. Perhaps a future article should include that to see if a relationship exists there as well. On a personal note, I've been to India twice. On both occasions and in completely different areas I noticed an extremely large amount of litter as well as an overall lack of hygiene. That, coupled with the humid environment and over-populated state would allow disease to spread quickly, thus lowering the average life span. I came back with a parasite that required treatment after my 2nd visit. The countryside, however, is some of the most beautiful I've ever seen anywhere. I'm wondering where you got your data from for this graph? All articles list the data source under the "Data:" section, which is usually below the written article. In this case, it's the World Health Organization.